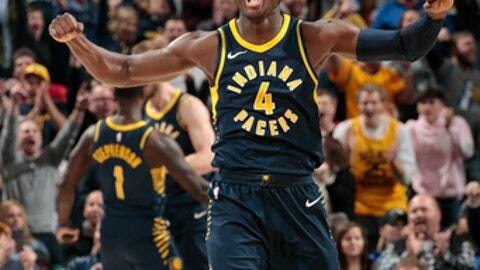 INDIANAPOLIS (AP) Victor Oladipo and Lance Stephenson delivered the perfect combination for the Indiana Pacers. After watching their fatigued and foul-prone teammates spend most of the first 3 1/2 quarters scrambling to stay close, the tag-team energizers took matters into their own hands Saturday night. They drove and dished, they made shots and they defended. It was a knockout finish. Oladipo scored 24 points, Stephenson added a season-high 21, each had five rebounds and six assists, and the Pacers overcame a late 10-point deficit to get past the struggling Orlando Magic 114-112. The Pacers powered through on grit. After trailing by as much as 21, Oladipo’s 21-footer in the midst of a 15-0 run finally gave the Pacers their first lead at 107-106 with 3:30 to play. And they closed it out by finishing the game on an 18-6 run over the final 6:15. Still, it almost wasn’t enough. After Domantas Sabonis missed 1 of 2 free throws with 20.5 seconds to go, Orlando got two chances to tie the score and one to win it. But Aaron Gordon missed a 16-footer with 12.5 seconds left then missed two free throws with 7.9 seconds to go and Jonathan Simmons missed the go-ahead 3-pointer before Oladipo finally corralled the last rebound. Magic coach Frank Vogel expected nothing less from his former team. Each time he sensed the Pacers were about to make a run, Vogel called timeout even after the Pacers cut a 106-96 deficit to 106-95 on Sabonis’ layup with 5:32 to go. But the last timeout didn’t slow down Oladipo, Stephenson or the Pacers, who scored the next six points to take a 111-106 lead. Gordon had 22 points, 11 rebounds and four assists and Evan Fournier wound up with 19 points for the Magic, who have lost seven straight in the series and 19 of their last 22. Magic: Elfrid Payton had 12 points and five assists on a night Orlando shot 54.5 percent from the field and scored 70 points in the first half. … Only 10 opponents have failed to score at least 100 points against the Magic this season. … Orlando has lost 18 of its last 20 to Indiana, dating to March 2013, and hasn’t won in Indianapolis since 2014. Pacers: Thaddeus Young scored 20 points and Sabonis finished with 18 points and nine rebounds. … After shooting 33.3 percent in the first quarter, Indiana shot 63.4 percent from the field in the second half. … Indiana has given up 143 points in the first half of its last two games. … The Pacers have won 10 of their last 11 home games against Orlando. Pacers center Myles Turner returned to action Saturday after missing the previous nine games with an injured right elbow. In less than 11 minutes, Turner had four points three rebounds and no blocks. Vogel wasn’t sure how long he’d last on the sideline. During pre-game availability, Vogel acknowledged he’s tried myriad treatments to fight off a cold and his voice was still pretty weak. ”I’m going to try to coach but I’ve been coughing an awful lot so we’ll see how that goes,” Vogel said. He did make it through but is now 0-3 at Indiana and 0-7 against his former team. Magic: Will try to salvage a split in the season series Tuesday at Houston. Pacers: Host Charlotte on Monday in the first of four meetings between the teams this season.